Baralaba Uniting Church Congregation worships on the 1st and 3rd Sundays of each month, from 9.30am, followed by a time of refreshment and fellowship. Occasionally on 4th Sunday, some members of the congregation gather from 9.30am for an informal discussion based around a dvd, and also share a cuppa. 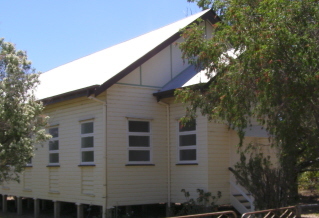 The address of the church is Power Street, Baralaba, and it’s located in the same street as the Baralaba State School, and the Anglican and Catholic Churches.